Looking for a USED HPI-3047-36LA2? Having developed for more than a half century, Jiangsu Yawei Machine-Tool Co.,Ltd has now an area of more than 200,000m2, assets more than RMB 200 millions yuan. Yawei brand is the famous brand of Jiangsu and Yawei Co. is both international key enterprise with high and new technology and civilized unit in Jiangsu Province. Besides these, R&D institute of Yawei is technology center of Jiangsu province with postdoctoral technical innovation center in it. 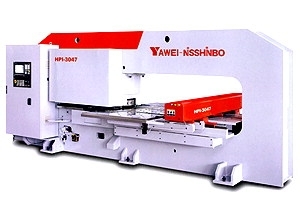 In 2005, CNC machines won the first batch of China top brand, In 2007, Yawei won the China famous brand. Yawei Co. is an international share company, specially engaged in manufacturing CNC turret punch, CNC laser cutting processing such as CNC press brakes, CNC shears sheet metal, and coil metal processing such as CNC fly cutting lines and CNC slit-recoil lines. Now Yawei owns son companies, Sino-Japan Cooperation Yawei NISSHINBO CNC Precison machinery Branch; Sino-Swiss Jiangsu EPT Metal-Forming Machine Tool Co., Ltd; Sino-Italy Jiangsu Selema Coil Line Processing Co., Ltd; SMD Europe BV. With a leading consciousness, total new mind, first-class manufacturing ability, combing the overseas advanced technologies, Jiangsu Yawei is engaged in researching and developing the top-grade products of the same trade, supplying domestic and international customers with leading machines and service. 67 ModelsView more about Yawei (Henan) Machine Tool Co., Ltd.